My class visited one of the sites where Hamline's organic waste is sent to: Interesting things: the Shakopee Mdewakanton Sioux Community (SMSC) Organics Recycling Facility (ORF). It was great to see where our food waste goes, and it was exciting for me to see a commercial composting facility since I am currently working on a project comparing composting with anaerobic digestion. This ORF accepts 150,000 tons of organic waste annually, and the footprint is relatively small. There are plans to move to a larger site so they can expand their operation. They accept both residential and commercial organic waste. Each load is assessed, and if it is more than 5% contaminated, it is rejected, and the hauler has to bring it to a landfill. The most surprising thing I learned is that they use a ratio of 25:1 for carbon and nitrogen (essentially, yard waste to food waste). This is much higher than the backyard compost and vermicompost ratio I'm used to of 2:1. It's because the large windrows don't need as much nitrogen to reach high heats. Temperatures and moisture levels are monitored closely throughout the process. If it's too dry, there is a drip irrigation system; if it's too wet or too hot, they use a windrow turner to fluff up and mix the compost. The machinery is a particularly cool piece of this. All the organic waste goes through a grinder to help it break down faster. The aforementioned windrow turner straddles the ten-foot-tall windrows and rotating blades mix it up. Finished compost goes through a screener. The smallest stuff is ready for sale. The larger pieces can be returned to windrows to continue breaking down. Another surprising thing I learned is that contamination is removed after composting, not before. Many of the windrows we saw had pieces of plastic that has floated to the top, so it looked more contaminated than it really is. In the screening process, plastic is light so it gets blown off. The ORF's residual rate of what they have to send to a landfill is less than 1% of everything they accept. The ORF offers several finished products in addition to pure compost. 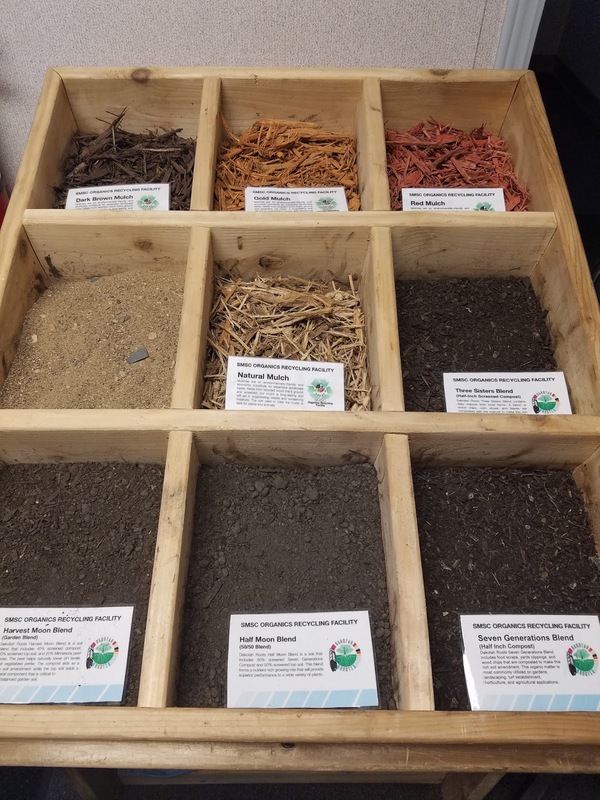 Their blends (compost mixed with dirt and/or sand) are the most popular. The photo below shows their different products. This was a great experience to see how a large composting facility operates, and I've already worked what I learned into my research paper.